The first 50 customers to purchase a new Western Garage between now and March 31st, 2019 will get their old garage removed absolutely FREE*. That's a savings up to $2,000.00. Take a typical 16x20 single car garage, that's 320 square feet. The cost to remove a garage and slab this year is expected to hit $6.25 per square foot or $2,000.00 for a 16x20 single car garage. This is a very limited time offer and the first 50 Free garage removals will go fast, so contact Western now and get the best pricing of the 2019 garage construction season. 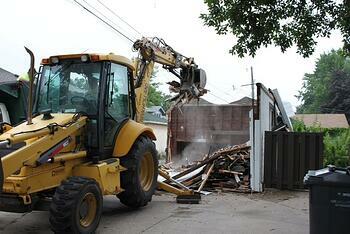 Western Garage Builders will recycle your old garage. Every garage slab we remove will be brought to a recycle center, ground into small pieces less than 1"x1" and then used as the perfect base under your new slab. I also have a contact who will try to remove your old garage in one piece. If it's in good enough shape he'll try to re-sell it. In most cases the cost to move your garage to another location is higher than the demolition cost but it's still worth the effort. HURRY, Western's Free 69th Anniversary Garage Removal Special is available for a Limited Time Only. What should you do next? Please contact one of our trained specialist for a free quote, its that easy. You can fill out our contact form now or call Minneapolis Saint Paul 952-920-8888. Hurry, Western's FREE Garage Removal Special is available for a limited time and will end March 31st 2019. *Limited time offer. Offer good only on Detached Garages purchased from Western Constriction, Inc. Free garage removal up to 320 square feet, Not valid with any other offer.